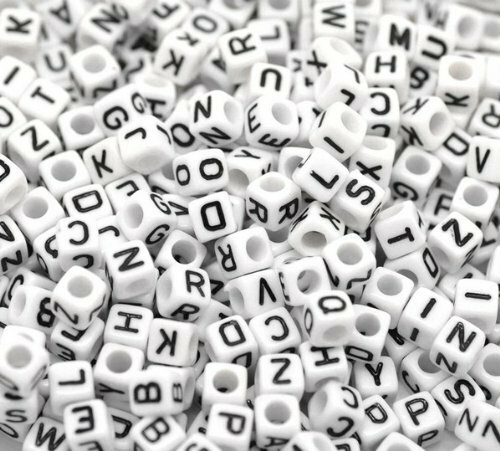 The print of our letter beads is very clear, not vague as other beads. They are square cube beads with round edges. The 26 kinds of letters are evenly distributed in one package. Bead Size: 6mmx6mm (1/4 ") Hole size: 3.4 mm (1/8 ") Color: White beads with pink, blue, green, yellow, orange, and purple letters. These beads can be used for party games, and your children will enjoy a lot of fun. With 26 letters in 6 different colors, you can mix and match, and DIY unique name jewelry or spell the words you want to express as a one and only gift for Mother's Day, Teacher's Day, Children's Day, Thanksgiving etc. These letter beads can also help your children to form a preliminary understanding of Alphabet, exercise the flexibility of your children's finger and wrist. So they are ideal for pre-schools, enabling teachers to organize a wide variety of educational activities. This pack of 800 acrylic beads are perfect for a DIY enthusiast too. Note: For children under the age of 3, please use under adult supervision and be careful of choking hazard. The print of our letter beads is very clear, not vague as other beads. They are square cube beads with round edges. The 26 kinds of letters are evenly distributed in one package. Cube bead size: Size: 6mmx6mm (1/4 ") Hole size: 3.4 mm (1/8 ") Color: White Black. Features These beads can be used for party games, and your children will enjoy a lot of fun. 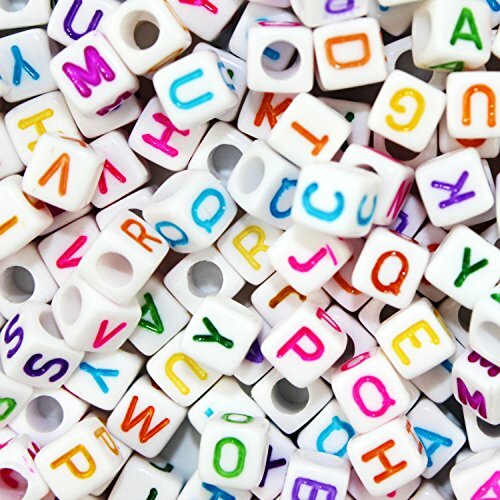 These letter beads can also help your children to form a preliminary understanding of Alphabet, exercise the flexibility of your children's finger and wrist. So they are ideal for pre-schools, enabling teachers to organize a wide variety of educational activities. Great kit for DIY rainbow loom rubber bands, bracelet, kids craft etc., and wonderful gift for children, friends or yourself. Cute alphabet beads can make a loved one of yourself name, favorite word etc, very beautiful and interesting. No glue, no mess! Just simply poke through your Rubber Band into the Big holes and add-on to your loom project. 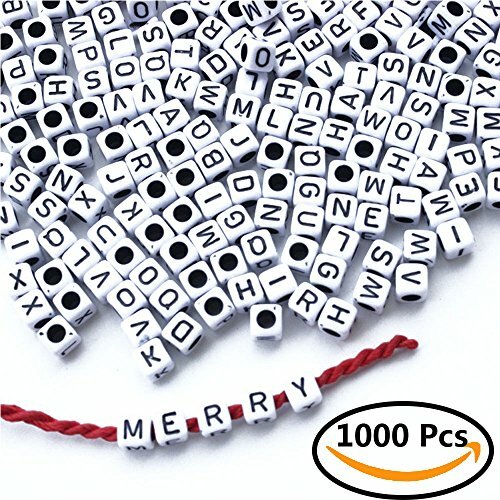 With 26 letters in 6 different colors, you can mix and match, and DIY unique name jewelry or spell the words you want to express as a one and only gift for Mother's Day, Teacher's Day, Children's Day, Thanksgiving etc Note: For children under the age of 3, please use under adult supervision and be careful of choking hazard. 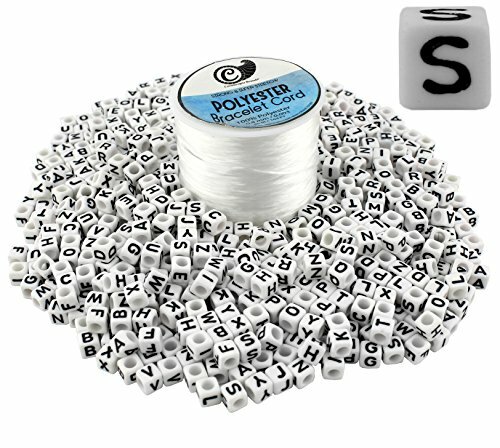 800 Alphabet Beads & One Spool of Jewelry Making Thread Uses: Make name bracelets, "I love you" bracelets or even emergency alert bracelets Weave for necklaces too Or make "hair ribbons" that spell Features: Jewelry making cord: .8 mm thick, white polyester, 50 meters (164 feet) 6.1 millimeter (.24 inch) cube-shaped beads: white beads with black letters Each letter is printed on all 4 sides of bead Comes in resealable zip-loc style clear bag Caution: Small parts, not suitable for children under three. 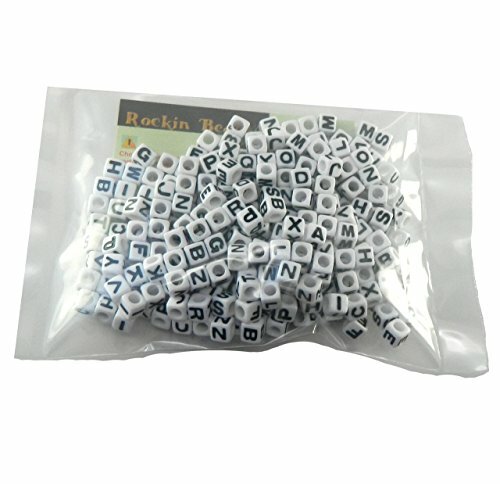 Package include:100 pieces alphabet letter beads. 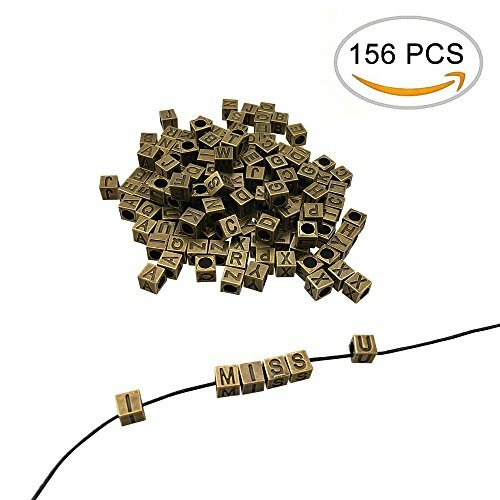 MATERIAL: These antique bronze letter alphabet beads are made from high quality zinc alloy. 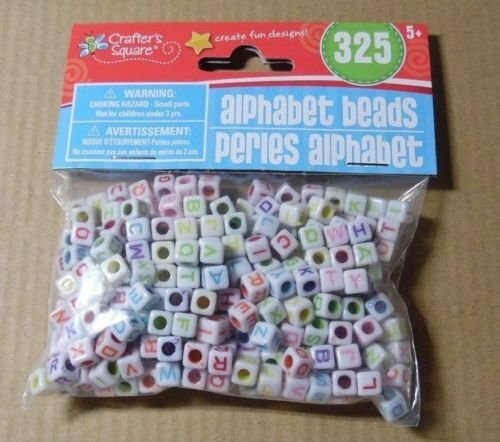 PACKAGE: 156PCS alphabet letters "A-Z" beads and 6pcs beads per letter. 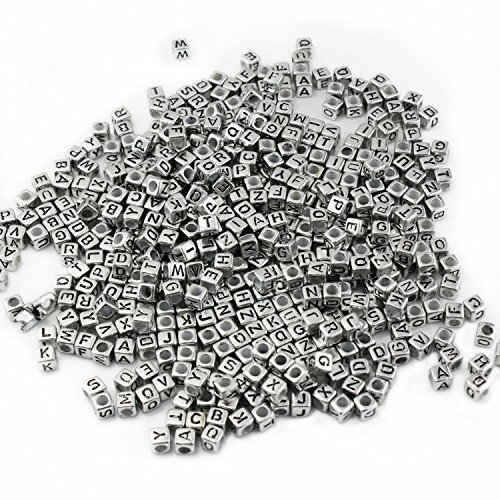 SIZE: Cube alphabet beads size: 0.276 inch(7mm), hole size: 0.19 inch(4.9mm). EASY TO USE: These fashionable and elegant metallic craft alphabet beads are perfect for jewelry charms making, DIY bracelets pendant necklace and keychain, also can be as a gift to family and friends, which can bring more fun and joy to their life. NOTICE: Not suitable for children under 3 years old. Spell it out! 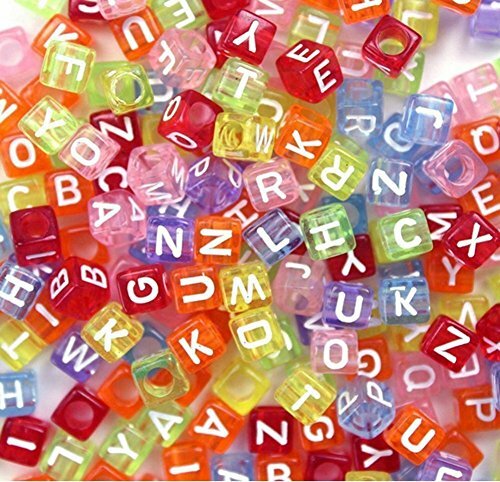 Stringable plastic alphabet beads in a rainbow of colors are great for arts and crafts, play, and more. Kids love spelling out everything from their names, to their crushes, to their favorite song lyrics on homemade necklaces, bracelets, and more. They provide hours of creative fun for group activities at school, home, day care centers, camps, and art classes. Ages 5+. Copyright © Wholesalion.com 2019 - The Best Prices On Square Letter Beads Online.